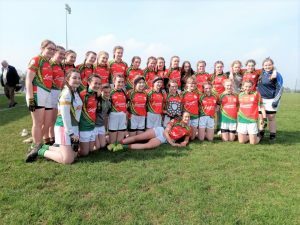 THE Carlow under-14 girls picked up their first piece of silverware of the Leinster LGFA season, winning the Leinster shield final in Coralstown /Kinnegad on Saturday. Carlow started the better with points from Orla Woods and Ella Molloy to get themselves into a 0-7 to 0-1 lead. With half-time approaching Louth struck for a goal. Carlow defended well in the opening half with Abbie Cooney, Hollie Sinnott and Rachel Tracey holding the last line of defence. In the half-back line Eva Doyle was excellent as was Grainne Thompson while captain Eimear Lillis marshalled the line with authority. The second half picked up from where the first left off with some very competitive football. Louth came out with renewed vigour and the intensity of the tackles and commitment of the players belied the age group playing. Megan Townsend and Brónagh Nolan were masterful in midfield, getting through a huge amount of work. As Louth applied the pressure Carlow had no option but defend and defend they did resolutely. As the score-line narrowed the Carlow supporters began to feel the pressure and become more vocal driving the team on. Carlow’s half-forward line was the line that contributed the bulk of the scoring with player-of-the-match Orla Woods scoring 0-6 points and Ella Molloy contributing 1-2 from play. The trio completed by Ailbhe McGuire who popped up with an excellent point in the first half. Sinead Thompson performing a supporting role for her defence was very disciplined and in the second half got through trojan work. Niamh Byrne at full forward caused lots of problems for the Louth defence, while Ellie Dowling worked really hard on and off the ball. Replacements Alannah Guerin and Sarah Curran when introduced made significant contributions in attack and also in defence when the need arose in the final minutes. Carlow goalkeeper Ella Meyler made a string of fine saves especially in the latter stages, and without whose efforts the result may have been very different. Carlow now go into the All-Ireland series later in the month. Carlow: Ella Meyler (Ballon); Abbie Cooney (Eire Og), Hollie Sinnott (St Andrew’s), Rachel Tracey (St Brigid’s); Grainne Thompson (Bennekerry/Tinryland), Eimear Lillis (St Andrew’s), Eva Doyle (Bennekerry/Tinryland); Megan Townsend (0-1, Eire Og), Bronagh Nolan (Old Leighlin); Orla Woods (0-5, Bennekerry/Tinryland), Ella Molloy (1-2, Rathvilly), Ailbhe McGuire (0-1, Clonmore); Ellie Dowling (Bennekerry/Tinryland), Niamh Byrne (Eire Og), (Sinead Thompson) (Bennekerry/Tinryland). Subs: Sarah Curran (Rathvilly) for Niamh Byrne (h/t), Alanna Guerin (Bennekerry/Tinryland) for Dowling (55 mins). Rest of Panel: Hannah McCabe (Old Leighlin), Shauna Sweeney (Eire Og), Amber Kirby (Old Leighlin), Marie Cranny (Bennekerry/Tinryland), Sarah Hutton (Eire Og), Aimee Moore (Eire Og), Faye Elliot (Rathvilly), Ruby Collier (Rathvilly), Sorcha Dunne (Bennekerry/Tinryland), Molly Doyle (Bennekerry/Tinryland), Roisin Kennedy (Bennekerry/Tinryland), Ailbhe Gavin (Bennekerry/Tinryland).